While discussing Servlet API, I have discussed little bit about Generic Servlet. 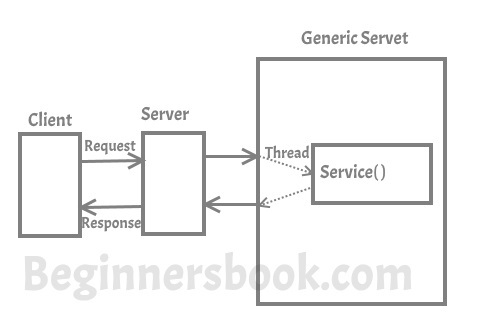 In this article, I will discuss Generic Servlet in detail. A generic servlet is a protocol independent Servlet that should always override the service() method to handle the client request. The service() method accepts two arguments ServletRequest object and ServletResponse object. The request object tells the servlet about the request made by client while the response object is used to return a response back to the client. GenericServlet is an abstract class and it has only one abstract method, which is service(). That’s why when we create Generic Servlet by extending GenericServlet class, we must override service() method. 3. To write Generic Servlet you just need to extend javax.servlet.GenericServlet and override the service() method (check the example below). Working with Generic Servlet is not that easy because we don’t have convenience methods such as doGet(), doPost(), doHead() etc in Generic Servlet that we can use in Http Servlet. In Http Servlet we need to override particular convenience method for particular request, for example if you need to get information then override doGet(), if you want to send information to server override doPost(). However in Generic Servlet we only override service() method for each type of request which is cumbersome. I would always recommend you to use HttpServlet instead of the GenericServlet. HttpServlet is easier to work with, and has more methods to work with than GenericServlet. 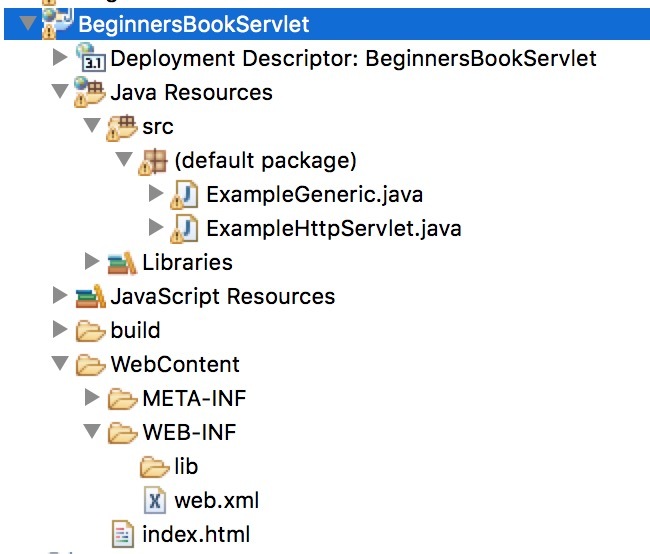 I have explained each and every step for creating Servlet in Eclipse IDE, however if you new to Eclipse and don’t have it installed on your System then refer this guide: How to install Eclipse, setup Tomcat and run your first servlet program using Eclipse IDE. Here is the list of all the methods of GenericServlet class. 1. public void init(): it is a convenient method. This method can be overridden so that there’s no need to call super.init(config). 2. public void init(ServletConfig config): Called by the servlet container to indicate that the servlet is being placed into service, this method is used for initializing the servlet. 3. public String getInitParameter(String name): Returns a String containing the value of the given initialization parameter, or null if the parameter does not exist. 4. public Enumeration getInitParameterNames(): Returns the names of all the parameters defined in the web.xml file or null if web.xml does’t have any parameter. 5. public abstract void service(ServletRequest request, ServletResponse response): Called by the Servlet container to allow servlet to respond to the requests made by client. 6. public void destroy(): It is called by servlet container once at the end of servlet life cycle to indicate that servlet is being destroyed. 8. public String getServletInfo(): Returns information about servlet. 10. public String getServletName(): Returns the name of the servlet instance. 11. public void log(String msg): Writes the given message in the servlet log file. 12. public void log(String msg,Throwable t): Writes the explanatory message in the servlet log file including a String that describes the error or exception.